Watching The Tree of Life was the equivalent of being pinned under the trunk of a tree, unable to move. Thus you are forced to stare at the stars and the sky and ponder the wonder, majesty, and unfairness of Creation, all the while wishing you could break free to resume your normal, happy day. Or you just think, Dear God, please just let it all end! 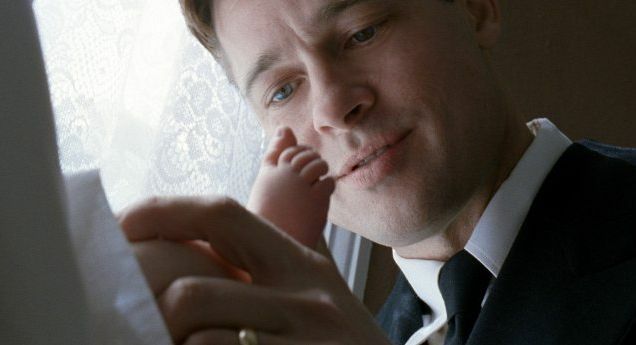 In The Tree of Life, writer-director Terrence Malick tells the story of a young boy torn between the themes of "nature", his well-meaning but overbearing father Brad Pitt, and "grace", his saintly, effervescent mother Jessica Chastain. Malick eventually accesses the human story after juxtaposing their lives against the Creation of the Universe, the Earth, and all life, utilizing breathtakingly beautiful photography, editing, and his trademark ponderous voice overs. After a while, staring at asteroids, the stars, and galaxies, one is reminded of Bart Simpson looking through his telescope in "Bart's Comet": "Wow. The universe is so boring!" When The Tree of Life becomes Earthbound, we spend the remainder of the film with Brad Pitt's family in 1950s Waco, Texas. Pitt was an aspiring musician who regrets abandoning his dreams to become a struggling businessman. His sons chafe under his stern, sometimes abusive parenting. His eldest son, played as a boy by Hunter McCracken and by Sean Penn as an adult, both hates and loves his father, as he starts turning into a little sociopath. The boys' idyllic lives of carefree play is routinely interrupted by violence at the dinner table, spousal abuse seen through the windows of neighbors, and the cruelty adults are capable of passed down via learned behavior to their children. Then it's back to outer space, the stars, the galaxies, nebulae, black holes, and Malick's vision of the Afterlife, which is a deserted beach where everyone you ever knew wanders about the surf in a state of confusion. This is how the audience feels when ambling out of the theatre after seeing The Tree of Life. Roger Ebert had the exact opposite reaction. what happened to the back of the second childs head? i didn't get that part! I watched 20 minutes of it just now, then went on the internet to read the reviews to see if it was going to get any better... turns out I was right to stop watching it. Even after 20 minutes I felt sleepy, bored and couldn't understand anything in the film because I couldn't hear any of them whispering, and the background music is too loud when I turn up the volume. Anyway, at least I downloaded it for free instead wasting my money going to see it!! That's the only positive thing I have to say about it.